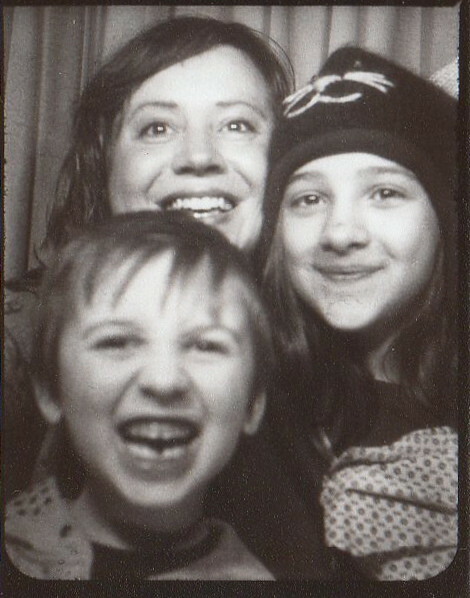 sometimes photobooth frames capture exactly who we are in a particular moment. not always, but sometimes. I'll admit, when the booth first spit this strip out, I was a little disappointed. ezra did exactly what I told him not to do-- that is, move in close and make the crazy face. four whole frames of variations on the crazy face. but the more I look at this, the more I love it. because it's exactly who we are right now. ezra, all goofiness and loose teeth and straw-like bangs. ava, all smiling eyes and soft preteen edges and the kitty cat hat she won't take off. and me in the background-- loving them both so much I can hardly stand it, trying so hard to hold onto them like this but failing miserably. because you can't hold on, it doesn't work like that. so you grab them and put them in a photobooth every once in a while and when the strip comes sliding out, you silently celebrate your triumphant (albeit small) attempt to stop time. This makes me smile as big as all three of your smiles combined. I love it! I can relate, and it makes me happy and sad, all at once. and you all are just full of dorky adorableness--i love it. What a great family ritual. Such a beautiful post. Happy mother's day to you! Lovely post, Andrea. :) Happy Mother's Day to you! beautiful-so much that you've made me tear up! What a sweet tribute to your children, and a terrific photo. Happy Mother's Day to you! How beautiful. Happy Mother's Day! I know exactly how you feel. I find myself looking at my girls lately and wondering where time has gone. I want to freeze time, turn it back, hang on just a little while longer to these moments...but alas, time keeps ticking on. This was a perfect post to read this Mother's Day. Thanks for your beautiful words. so often we try for our mind's-eye 'perfect' photo, and there it was all along, in being ourselves. I just was cleaning out my studio and found a postcard from you from a postcard swap...it seems like forever ago when we both started blogging. I love this picture of you...and the inspiration you bring to my life. xoxo! I love how you embrace the everyday. How astute to read into the 'now' of this moment. this makes me what to cry... it seems like happy moments for me are always tinged with a bit of sadness, because i know the moment is fleeting and will soon just be a memory. hmm isn't life interesting... you have such a pretty way of explaining it though! oh you are so right! Wise and well said. Thanks for being such a wonderful lovely light. Your blog is always so inspiring! Hope you are having a spiffy week full of hugs and dancing!! this post made me all teary. what a beautiful way to put it. and your family is gorgeous. I love what you wrote. The photo is amazing. The words that come out of your heart.... they stop my own - just for a beat.